French Butter Dishes originated in the Middle Ages as a way to store butter before refrigeration existed. They preserve your butter by creating an air tight seal, keeping it soft and fresh for up to a month without needing to be refrigerated. To use, pack 1/4 pound (1 stick) of butter into the lid of the dish. Pour approximately an inch of water into the base. enough water to cover the inverted lid. Oil and water do not mix so your butter will stay fresh and soft. When you place the lid onto the base, an air tight water seal is created, which prevents air from spoiling the butter. 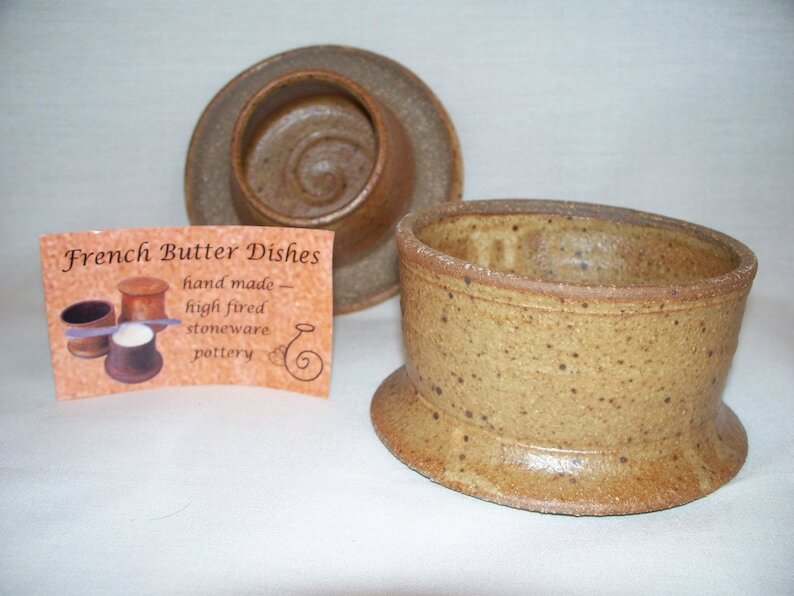 this listing is for a sandstone brown butter dish. Dimensions, approximately 3 and 1/2 inches tall by 4 and 1/2 inches wide. I ordered two, one was damaged in shipping. Seller rectified the situation immediately. The butter dishes are awesome. Can’t wait to gift them! I would definitely buy again. Just as advertised. Works great to keep butter soft and fresh. High quality, solid, beautiful piece of functional pottery. Given as a gift and the recipient has been using and loving it. My original purchase unfortunately arrived broken due to a shipping error and no fault of the seller. I notified the shop and they sent me a new one the next day, ensuring it would arrive by Christmas! Highly recommend, would order from this shop again.